The ultra dual shot Pro spec night vision QD reflex sight from Sight mark delivers not one, but two ways to dial in with pinpoint accuracy. Featuring a side-mounted Red laser for quick target acquisition, the shooter can fire quickly in close-quarter situations such as tactical training situations and Three-Gun matches. When sighting through the dual-pane glass, users can customize their view with one of the four illuminated reticle patterns. The ultra dual shot is equipped with a night vision mode, allowing users to mount the device in front of a night vision monocular and create a co-witnessed riflescope set up. Its featured double-pane glass lens system eliminates Parallax and retains accuracy when fired from the periphery of the lens. Users can quickly and effectively Adapt their firearm to the situation at hand with the included quick-detach mount. Its interlock internal locking system of the ultra dual shot holds zero extremely well, so the shooter does not have to continually re-adjust the sight in the field. The all-aluminum construction enhances durability, making it operable in various environments and situations. 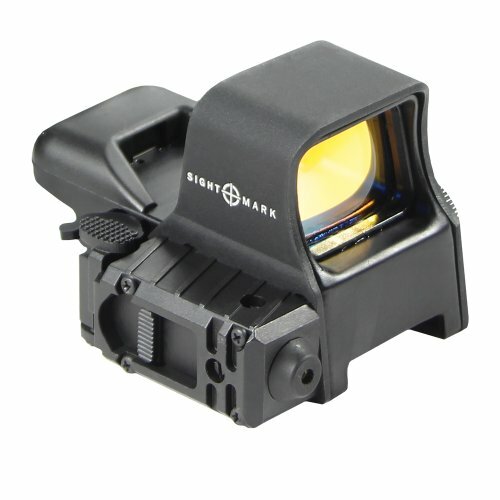 If you have any questions about this product by Sightmark, contact us by completing and submitting the form below. If you are looking for a specif part number, please include it with your message.